Black beans are an exceptional source of vegetable protein as are all beans. This soup is absolutely delicious served on its own or with steamed basmati rice, or tortilla chips and a side of salsa. Bring 6c of water to a boil- in case you need more. In a large soup pot, add the olive oil and sauté the onions and garlic until golden and soft. Add the chipotle powder, chili powder, cumin, black and red pepper. Sauté for 3-4 minutes and then add the black beans, stirring them into the vegetables. Add the boiling water and the bouillon cube (or powder). Add the salt in toward the end of cooking and adjust seasonings. Bring to a boil and reduce heat and simmer for 30-40 minutes. At this point, the soup is delicious as is or can be pureed to make a traditional smooth soup. I ate this with a heaping scoop of steamed basmati rice in it. In batches, in a blender or vitamix*, puree the soup. Adjust the seasonings before serving. Add 1c hot, cooked white or brown rice before serving. 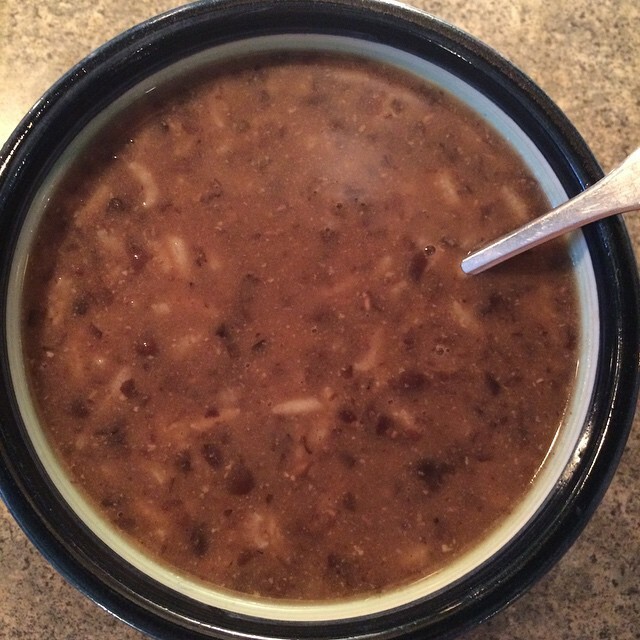 This entry was posted in bean dishes, soup and tagged vegan athlete, vegan protein, vegan soup. Bookmark the permalink.